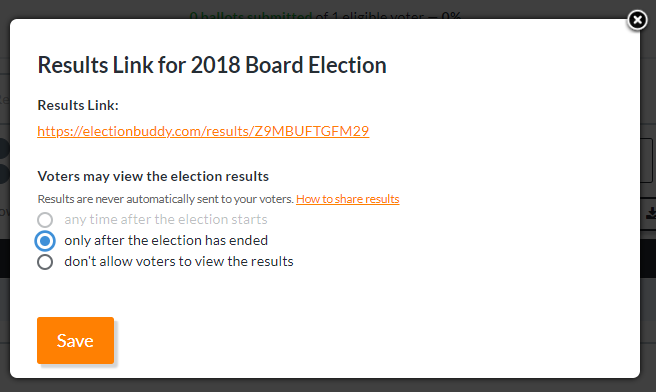 Electionbuddy allows you to customize when the results can be seen, and what is shown in the results. This can be customized for both the election administrator and the voters, and is done so on the first page of your election setup, the "Details" stage. With this setting, you control whether the voter's choices are visible with the results, and to whom they are visible. You can choose to either hide them entirely (as is required by many organizations' bylaws and governing legislature), show them just to the election administrator, or to show them to anyone who accesses the "Results" page of your election. This setting is non-adjustable once your election is running — so choose wisely! This setting is also non-adjustable when your election is running. If your settings are set to allow yourself to view the election results while it is running, the "Voted" status of your three most recent voters is obscured in the voter list. For more details, please see Why Not All "Voted" Voters are Showing as "Voted" in your Live Election Voter List. Once you are logged in, click on the election's name to be brought to the election's "Results" page. Click on the "Actions" menu in the top right, and from there, click "Results Link". A window will appear. On this window, you will see a replica of the Voter Results Viewability Setting that was present in your election setup. This setting works the exact same way: simply choose the viewability setting that works for you, and then click "Save". If "any time after the election starts" is greyed out, as it is in the image above, that means that the election administrator viewability setting is set to prevent the administrator from seeing the results until the election is over — it doesn't make sense for your voters to be able to view the results if you can't! When the results are viewable to the voters, the results link will be present in this window, as shown above. The link can be taken from that window and inserted into an email, or on your organization's website, in order to share the results with your voters.